This week in gold, the headlines were dominated mainly by news of the Federal Reserve’s final policy statement of the year and North Korea’s cyberattack on Sony Pictures Entertainment. On the blog we covered these stories and their implications for the precious metals market, as well as the Salvation Army’s recent string of donations in the form of pure gold coins. See below for a summary. 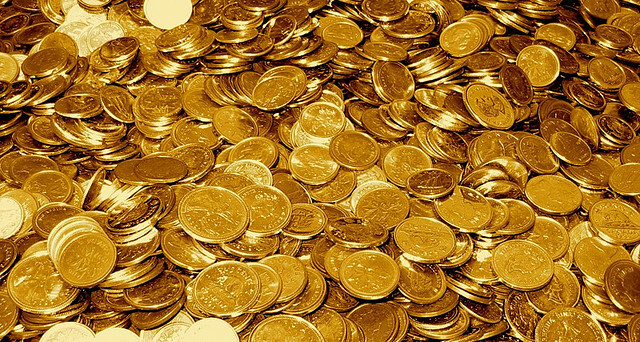 Many people drop spare pennies into Salvation Army buckets around the holidays…and others drop pure gold coins. Last week in Portland, Oregon, the Salvation Army discovered a 1-oz. Canadian Gold Maple Leaf coin in one of its donation kettles. This is not the first time this has happened – the Portland-area Salvation Army has received gold coin donations like this for the past six years in a row. Other major cities such as Tulsa and Houston have also received these mystery donations. The coin was wrapped in a note from the donor, to which Salvation Army spokeswoman Teresa Steinmetz responded: “We just want to say thank you for your generosity and for trusting the Salvation Army with this valuable coin.” Read more in Tuesday’s blog. The Federal Reserve released its final policy statement of 2014 on Wednesday, declaring it “can be patient” on the question of raising interest rates for the first time since 2008. In its last few statements, the Fed has asserted that interest rates will likely remain near zero for a “considerable time” following the end of its quantitative easing (QE) stimulus program in October, but the “can be patient” language is new and caught analysts’ attention. The stock market rallied after the news, while gold was little changed. Read more in Wednesday’s blog. The North Korean hack on Sony Pictures Entertainment is being treated by the White House as a “serious national security matter.” House cybersecurity chairman Patrick Meehan warned that the nation’s electric grid, Wall Street, and even the federal government could also be at risk following the cyberattack, and urged President Obama to look into legislation and other efforts that could better protect the U.S. from cyber threats. Could this potentially impact the gold market, and how? Check out Friday’s blog to find out. If any of this has piqued your interest in owning gold or other precious metals, call American Bullion today at 1-800-326-9598 or request a Free Gold Guide by submitting the form at the top of this page. Piece of gold, peace of mind.